On Saturday mornings growing up there was one rule, o n e. Do not wake up Mom and Dad. Didn’t matter how early you woke up, you’d better tip toe down the hallway, praying all the way, and balance your weight just right not to hit the creaky stair on the way down. Of course we had to turn on the TV– we couldn’t miss the latest episode of our favorite Saturday morning cartoon. Still as soon as you hit that power button, you’d better be frantically, maniacally be pressing the down volume button. Because no matter how low our parents’ had left the volume when they went to bed, that thing was going to start up sounding like a brazen alarm. How they heard it over my Dad’s epic snoring is still a mystery for the ages. We fixed ourselves bowls of cereal and milk, or the ever respectable pop tart and waited. My parents, just like my husband and I now that our kids can fend for themselves at first meal, valued those extra couple hours of sleep on the weekend. While we don’t typically cook breakfast, we’re big on brunch. And by brunch, we mean it can be, and will be, any combination of breakfast and lunch. For breakfast fare we’ve brought our yummy Sausage, Egg, And Cheese Sliders. Breakfast Egg Rolls with Sausage Gravy, anyone? How about takeout from home with our Copy Cat Taco Bell’s AM Crunch Wrap. Nothing I’d want to wake up and make before my first cup of coffee, but after an extra two hours of sleep and a hot cuppa joe– you betcha. Then there’s the lunchier end of things. I loooooove sliders for this, especially because they’re so easy to throw together ahead of time and have on hand. EXTRA time to snooze y’all, and still keep the troops happy and fed. We’ve brought you our relatively healthy, lightened up Tex Mex Chicken Salad. This Fall, we even shared our seasonal favorite, Cranberry Walnut Chicken Salad. 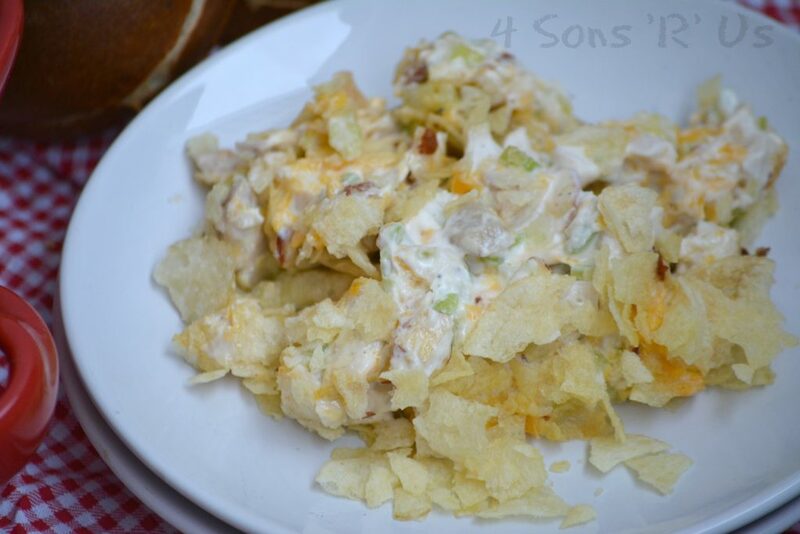 It’s time to raise the curtain and introduce you to the super yummy Hot Potato Chip Chicken Salad Casserole. This creamy, hot chicken salad is perfect for Winter– or any day where it’s frosty outside and you want something that’s a toasty treat. 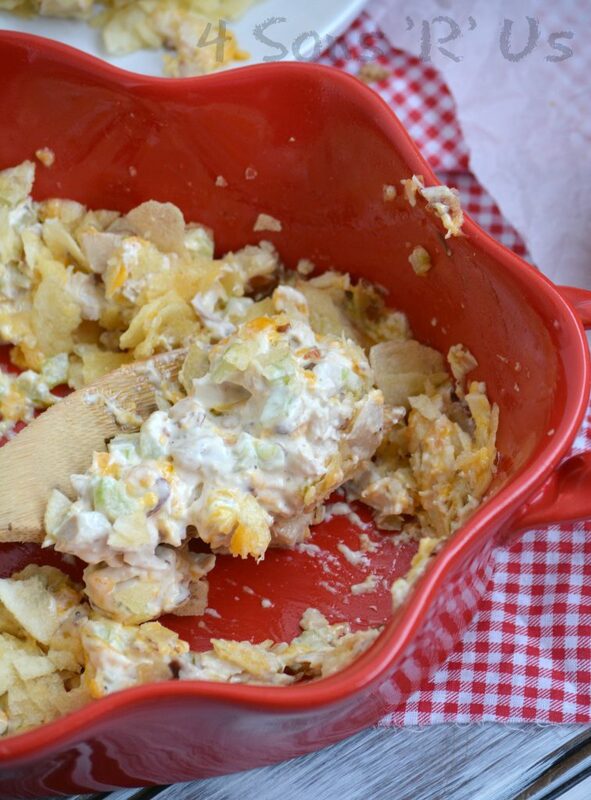 Hot Potato Chip Chicken Salad Casserole is our latest, maybe even greatest idea yet. 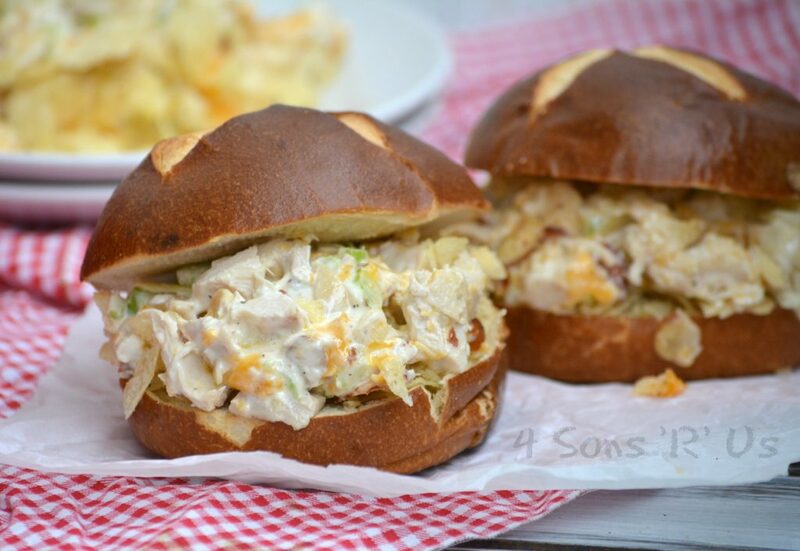 It’s an extremely creamy chicken salad with a nice crunchy texture to balance it out. 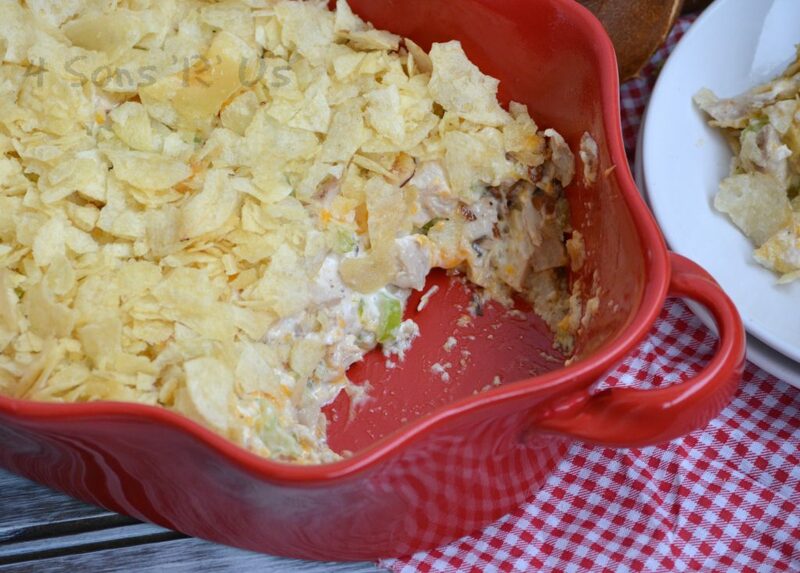 Baked so that the mixture’s bubbly and the cheese is melted, it’s topped with crisp salted potato chips for a fun dish that’s perfect for a potluck, and kid and parent approved. An easy chicken salad that's full of texture with a fun potato chip topping, served warm. Add all of the ingredients to a large mixing bowl, except the chips. Stir them to evenly combine. Spray a 9x9" baking dish with non stick cooking spray. Use a spatula to transfer the chicken salad mixture. Again, use the spatula to spread the mixture out evenly into the dish. Sprinkle the potato chips out evenly over the mixture. Bake at 350 degrees for 20 minutes, or until bubbly. Spoon the warm mixture onto rolls, and serve. You can serve this on warm croissant rolls for a treat. Alternatively, you can sub crispy fried onions for the potato chip topping. I love those extra hours of sleep. Great combination of flavors! Thanks for sharing with us at Fiesta Friday. Happy FF! Pinned! This looks delicious, thank you! I’ve pinned, will have to give it a go. Thanks, I’m so glad you liked it. All the good stuff on one sandwich…love it! Happy Fiesta Friday! I am SO HAPPY you put potato chips in the casserole. LOVE. One word – YUMMMMM!!! Thank you so much for sharing this with all of us at weekend Potluck! Will have to give it a try, i know my hubby will love it. I remember it from the 60’s, and never thought to make some kind of sandwich of it as shown here. Potato chips going on the grocery list now. Thanks, Charita. We completely agree with you! My mother-in-law gave this recipe to me in 1968…..just after we were married. I have been making it since then. VERY popular with the entire family and those with whom we have shared it. Delicious….I usually make it in a casserole……but those pretzel rolls look great…will do that next time. I had no idea it went that far back, Barbara! Yes, everyone we’ve ever served it for has fallen in love with it. 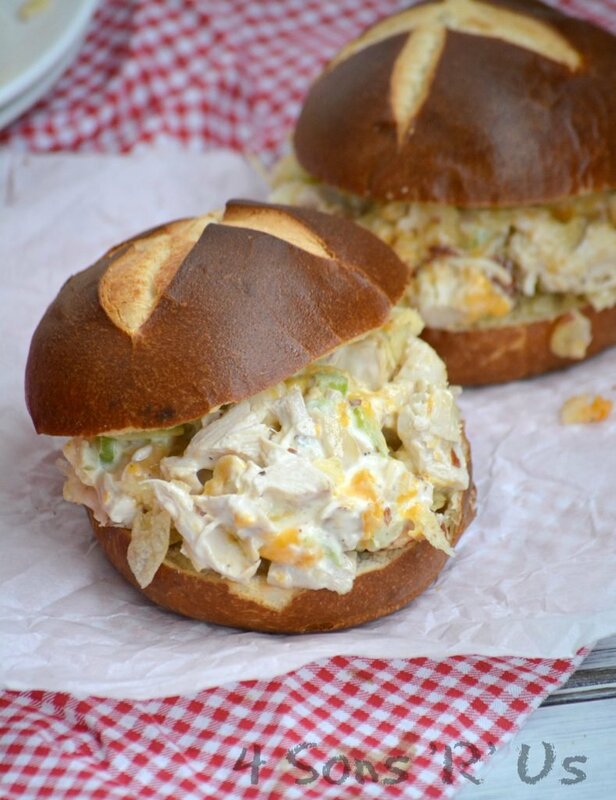 Definitely give it a try with pretzel buns! !